The Vehicle Reviews module allows customers to add their feedback and create reviews for any vehicle in your inventory in one touch. This feature can give your customers the most informed opinion on prospective vehicles. There is no need to search for reviews on car he is interested in the entire network, that will make life of potential buyer more comfortable by getting the full response on all questions on one page. 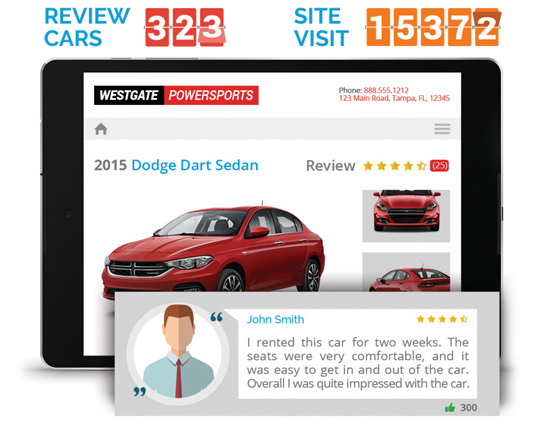 Vehicle reviews are fast and easy way to save your customer’s time. They can find all answers on one page with a few mouse clicks. Give shoppers the confidence they need to make a purchase decision. Does excellent customer service makes the purchase process so much more enjoyable and more profitable, doesn’t it? Even better, not only your customers can take advantage of Vehicle Review, but everyone who is looking for a new or used car and making its own research can find your website with this wonderful feature. Imagine, potential customer allocates a lot of time to find a good vehicle for the best price and start his search. He opens hundreds different sites with fragmented, not full enough reviews. It is not very pleasant picture, is it? But then customer finds link to your reviews and the situation improves. Much better, isn’t it? The more visitors, the higher traffic to your website and the more profitable SEO. Give the customer a reason to come back, make your site really interactive and create your own database with vehicle reviews. Autoxloo expects that Vehicle Review will increase consumer satisfaction making them more confident in contacting your dealership and ultimately buying cars from you.